I have been creating and testing a number of different power supplies in order to select the best one for my next data logger board. On this page, I will share the results of this testing . Objective: To find the best power supply for my 3.3V data logger what would support the most flexible and efficient use of rechargeable batteries. Using two 10 Ohm, 1W resistors in series, create a 165mW constant load. 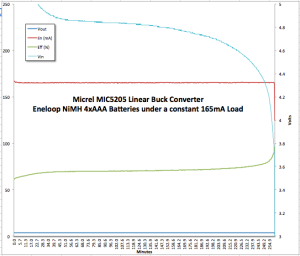 Tested a number of different battery options – 2xAA, 3xAAA, 4xAAA and LiPoly Single cell batteries. Under this load and with the batteries I had, the boost power supply was of little use. The only battery that could supply sufficient current for a sustained time was the LiPoly but the boost converter let the voltage float over 3.3V so can’t see using this one. 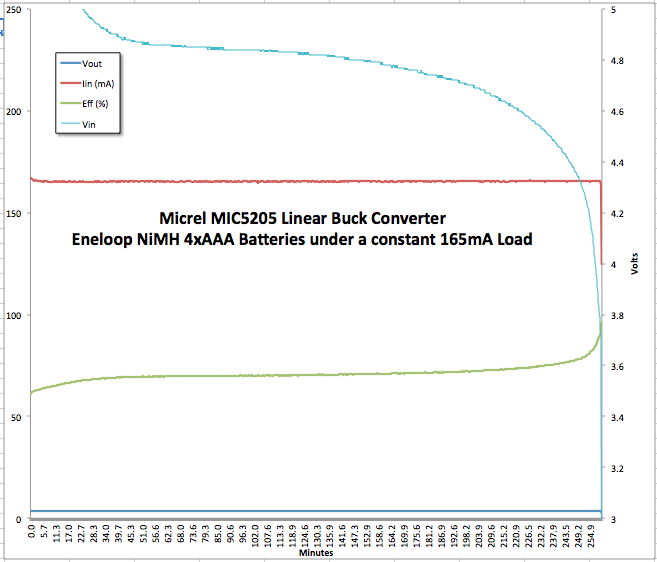 The Linear power supply from Micrel was excellent in all the tests showing only slightly less efficiency than the more expensive switched model from TI. This is the supply that Sparkfun uses on the Pro Mini and it has a very low drop out voltage. I was thinking of sticking with it. That is, until I tested with 4 AAA batteries. With the larger gap between Vin and Vout, the efficiency dropped to around 60% and climbed slowly as the batteries drained. 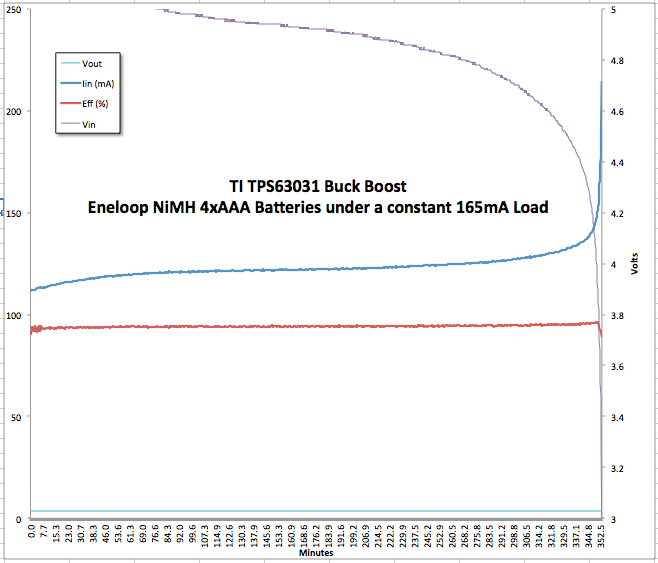 The TI Buck-Boost TPS63031 is a simple switching power supply and it was consistently the most efficient I tested. 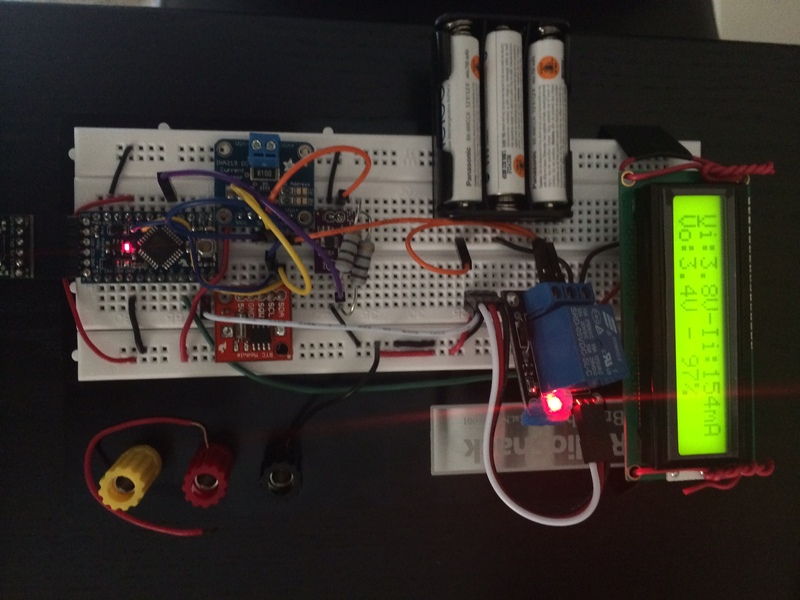 With 4 AAA batteries, it got 36% more power from the cells than the Micrel Linear model. Even though I am a bit nervous about soldering the QFN package, I am going to give this one a shot for the next round of boards. 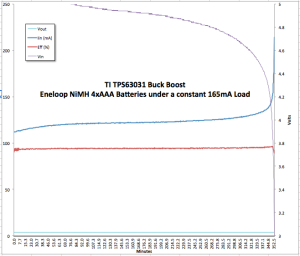 Here are a couple charts that show the relative performance of the switched and linear supplies for one battery run. If anyone wants to use the breadboard friendly designs I made for these tests, you can get them at OSHPark under my name. Notice the constant efficiency curve over the entire discharge cycle. The Linear supply, by contrast, increased in efficiency as the batteries drained.